Yesterday was a great day!! I did a 5K race in the morning and pushed myself to a personal best of 39:28 minutes. I was huffing and puffing so much at the finish line, wasn't sure I'd be able to breathe again. And then I was off to Maritime Modern Quilt Guild's Sew In!!! Work continued on Gravity blocks. It's been so fun playing along with the Gravity QAL hosted by Busy Hand Quilts. 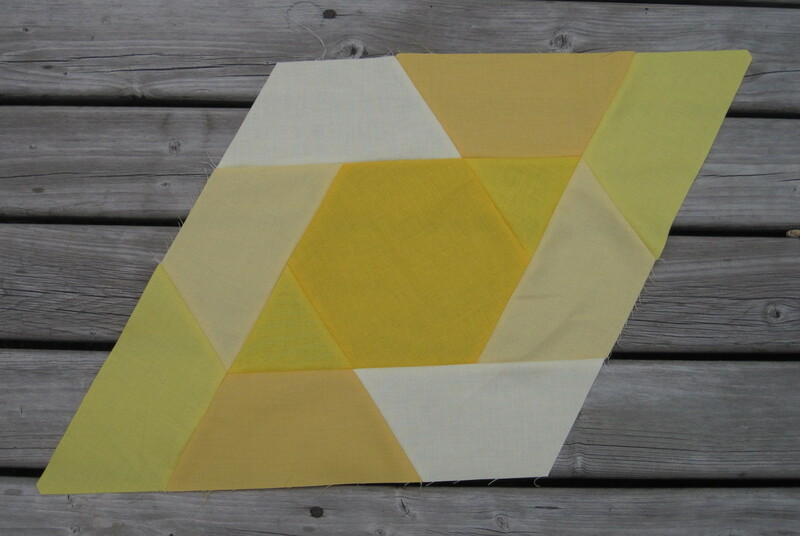 Block 6 - Ultraviolet is made in two colourways: yellow and purple. Three more blocks to go and then work begins on the background blocks. Can't wait to start piecing the blocks together. I hope there was sewing in your weekend. I'm looking forward to the Canada Day holiday on Wednesday so I can do more sewing. It's a double Finish Friday! Two baby quilts for my friends R and R in South Africa who just adopted twin girls. Since I can't be there to have a snuggle, proxy snuggles through my quilts will have to do. The black and white print and the two binding prints were the last of the fabric I purchased in Johannesburg in 2012 when I attended R and R's wedding. Had to throw in some Kona: Citrus, Kumquat, Kiwi, Water, Red, Tulip, and Mulberry. Since I had limited fabric (and no ability to run to my LQS for more), I had to be creative in the layout. In the end, there wasn't enough to put a border on the top and bottom. 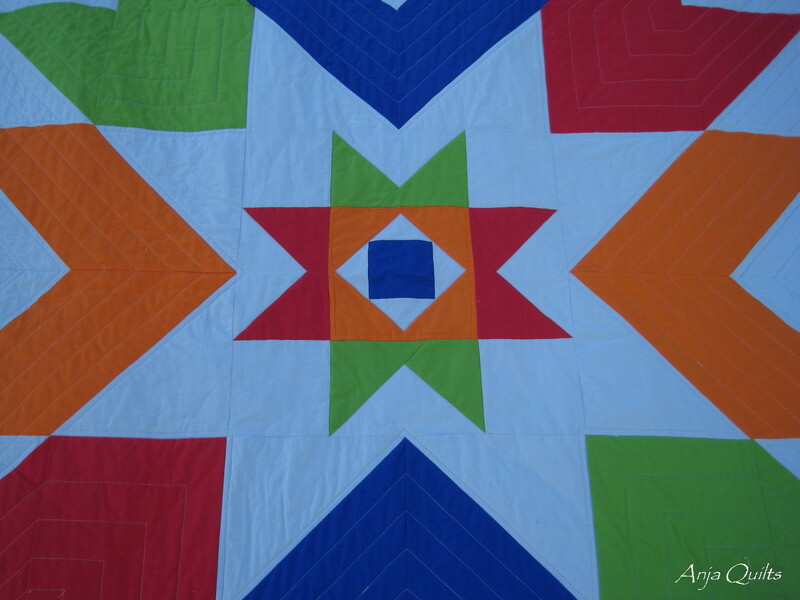 You may remember my longarm woes from the weekend...these were the quilts that I was working on. The quilts had to be in the mail to Winnipeg by Saturday 6:00 p.m., as R's mom was travelling to South Africa to see the new twins. Apparently, there are considerable "lost" packages, and R said I shouldn't mail anything to them. I was lucky that she was visiting and had room for my quilts. I had been saving the rest of my Johannesburg fabric, with no real plan for it. I so was happy to be able to use the fabric for quilts for two very special little girls. 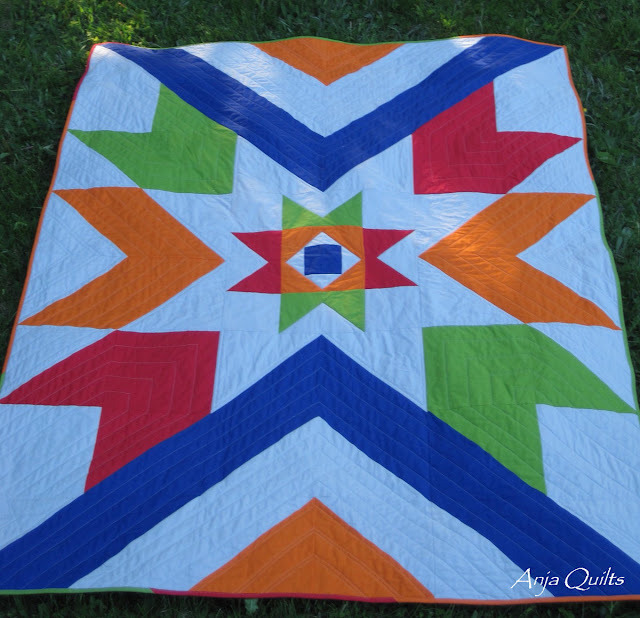 Welcome to Week 2 of the 2015 New Quilt Bloggers Blog Hop!! I'm part of the Sew Fabulous Hive. 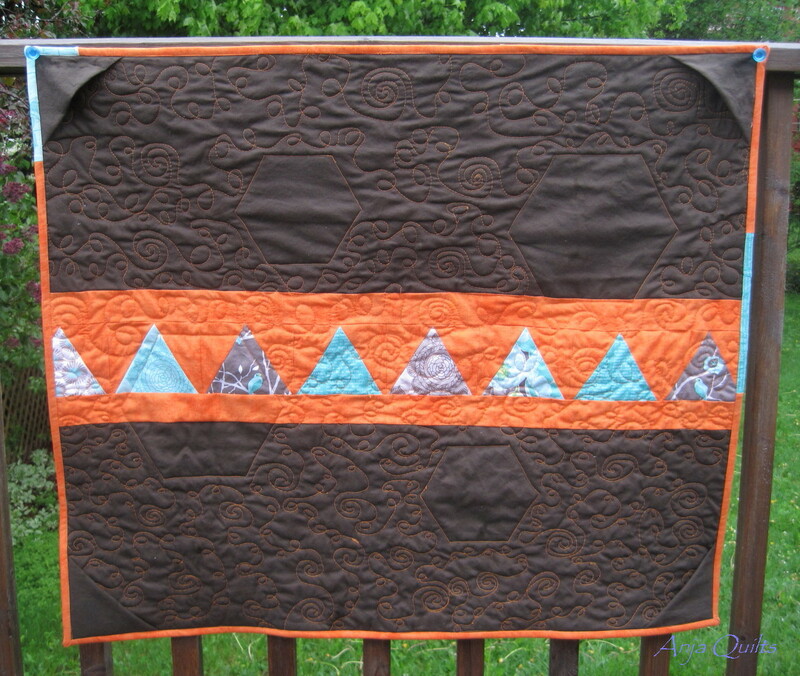 I began quilting in 2003 when I took a class at my LQS to make a flannel rail fence quilt for my nephew. Nephew has received a lot of quilts over the years, but none recently, as he is now 6-feet tall, and I can't imagine making a quilt long enough to fit him. He starts grade 10 in September, so maybe I'll plan for a grade 12 graduation quilt. I use fabrics and patterns that interest me, but recently, I have been leaning toward all things modern. Orange is my favourite colour. I belong to two quilt bees: Do-Bees which I joined shortly after I started quilting. 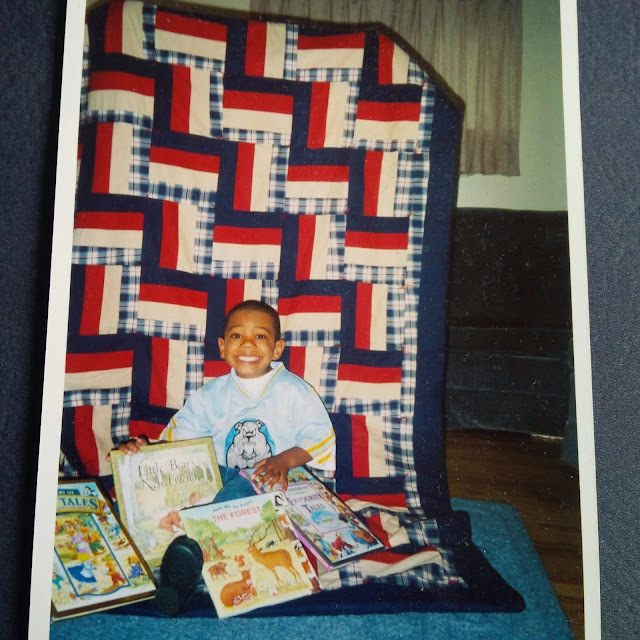 We are varied in age, quilting styles, and quilting abilities. My second bee is Q-Squared which is a group of four Girl Guide leaders who quilt, including my friend Jenn over at A Quarter Inch from the Edge. I also belong to the Maritime Modern Quilt Guild. Being a part of a quilting group helps me move outside of my comfort zone. Although I admit that more often than not, I have had to be pushed out while kicking and screaming. But I always learn something and am happy about the experience. You can read about my improv adventures here and here. 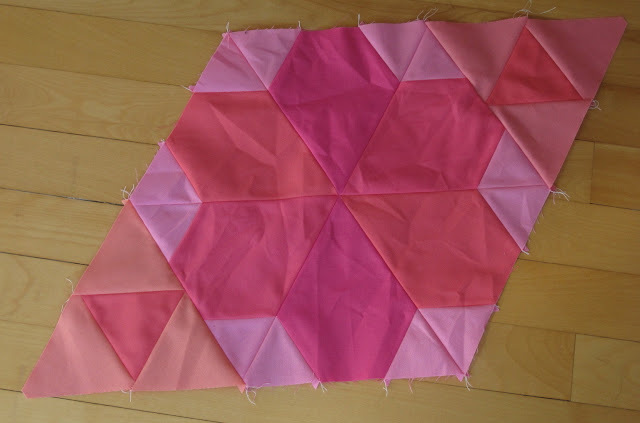 One of my quilting goals is to design. I am a follower of patterns, but want to get to the point of creating without a pattern. I feel that I am creative because I can make something by following a pattern, but I'd love to create just from a thought in my head. 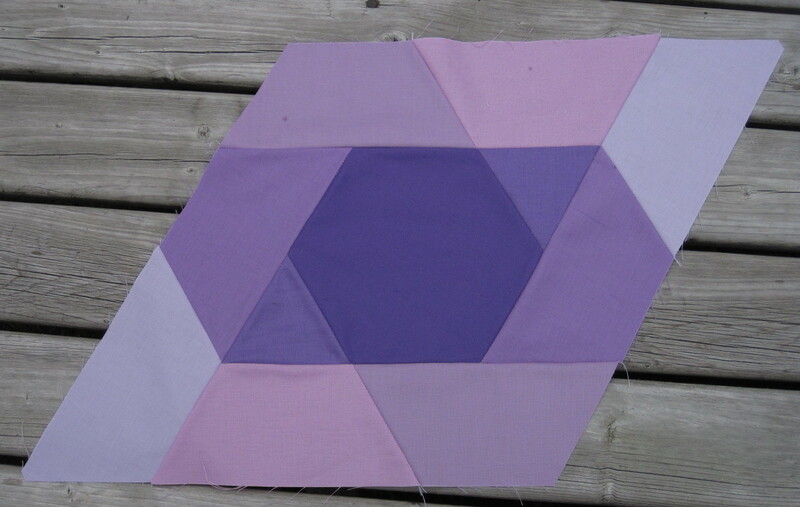 Once I saw a photo of a quilt that I wanted to make but couldn't find a pattern, so QD from my quilt bee did some math (a lot of her quilts are designed in Excel), and this was the result. Although I don't do it (yet), I think the key is to pre-write blog posts. I'm always scrambling to write a post so I can link up with a linky party. My goal is to get caught up on my WIP's (ha ha ha ha) and to have some posts pre-written. I have learned a lot by participating in this blog hop and plan to make changes to my blog over the summer as a result. If something doesn't seem to be working, double check and then double check again, even if you think you're doing everything correctly. I recently purchased a longarm. In my practice attempts, I have had issues with the thread breaking. Fast forward to this past Saturday morning as I was trying to quilt two baby quilts that had to be in the mail by the end of the day. The thread kept breaking, and after three broken needles, I sent a panicked text to Val over at Purple Boots and Pigtails (I purchased the longarm from Val). Luckily, Val was nearby and dropped by to provide assistance. It was such a small thing but had big implications -- I was winding one of the rollers the wrong way. Duh!! Do you finish one project before starting another one? My favourite part of quilting is piecing (and quilting is my least favourite), so I always have many projects on the go at the same time. And then I have to face the reality of having to quilt the tops. Dream Vacation Spot: South Africa and India. Plans are underway to visit Sangam (Girl Guide World Centre in Pune, India) in 2018 as my 50th birthday present to myself. I will have then visited all four World Centres. Favourite Book: Alex Cross series and Women's Murder Club series by James Patterson, In Death series by J.D. Robb, and Stephanie Plum series by Janet Evanowich. Monday Finish doesn't flow as well as Friday Finish, but this poor little quilt has been floating around my sewing room for far too long. So it needs some special attention. The Giant Starburst pattern is quick and easy to piece, but I wanted to quilt the arrows with straight lines, which involved marking the lines and a lot of turning of the quilt. I was a Frixion pen convert for marking lines. But, I just discovered that the pen marks have re-appeared on my own Giant Starburst. You can only imagine the dismay, horror, and panic I felt. I still haven't dealt with the issue because I'm afraid I can't fix it. So the Frixion pen has been banned from my sewing room. Time to find another method of marking. If you have a great marking tool or suggestion, I'd love to hear about it. So after some eye-balling (not a success) and marking with a quilter's pencil and a blue ink water pen, I finally finished. It will be delivered in the morning. Still some decent light in the backyard at 7:30 p.m. as the sun goes down. Love summer!!! I hope little J likes it. He picked the colours, and his bedroom has been painted in these colours. 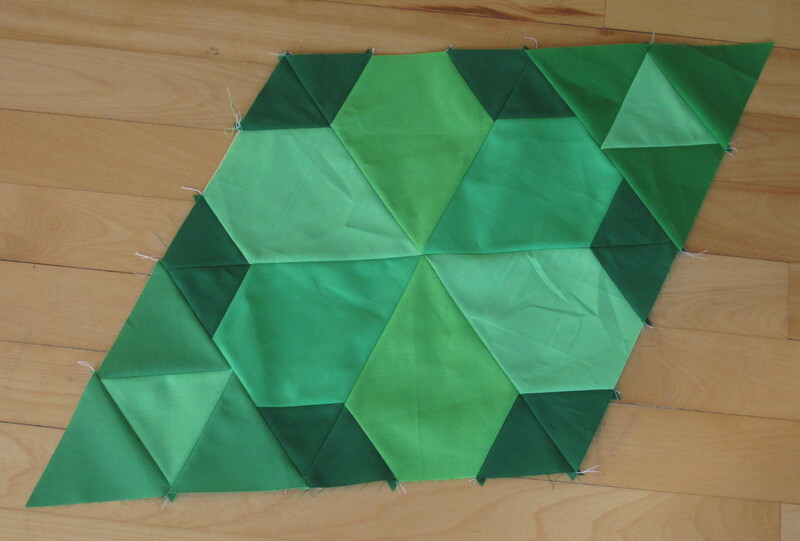 Not much quilting in the centre, just some stitch-in-the-ditch. 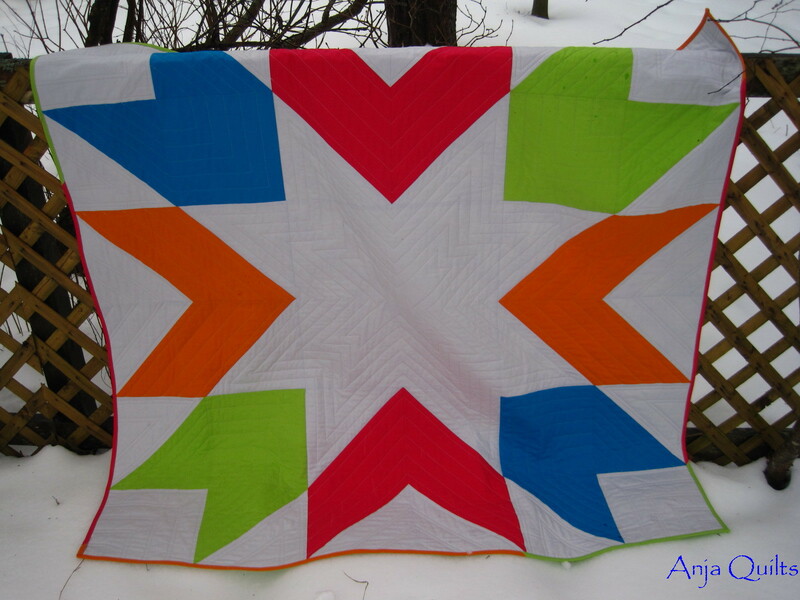 As I previously mentioned, I joined the 2015 New Quilt Bloggers Blog Hop. It's been great getting to know some great bloggers and to learn some helpful blog tips. 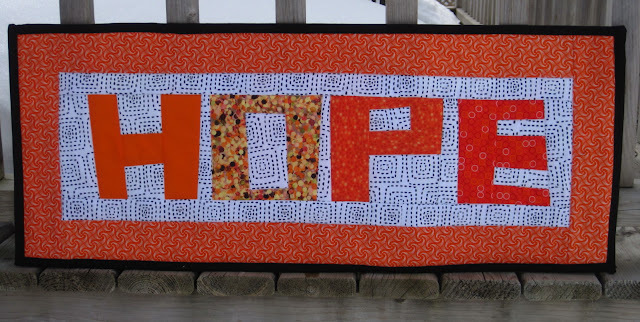 I belong to the Sew Fabulous Hive, and today is the first week of the blog hop. I encourage you to stop by and visit all the great blogs. 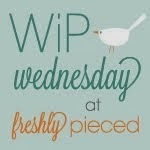 My turn on the blog hop will be next Monday. There are about 70 participants this year, so there is lots to see. And there are giveaways. Thanks for stopping by. I hope you have a great week filled with lots of quilty fun. WIP Wednesday - I Love Gravity! I have been having so much fun with the Gravity Quilt Along hosted by Busy Hands Quilts. If you haven't jumped on board yet, there's still time. I'm hoping to win a prize for the Block 4 linkup. 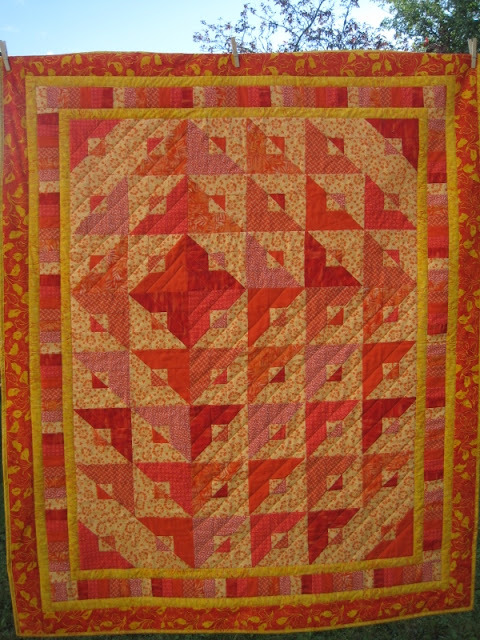 One of the prizes is Skip the Borders book by Jaybird Quilts -- I have been wanting it for some time. Checking off so many Kona colours. I just might achieve my goal of using all 303 colours. 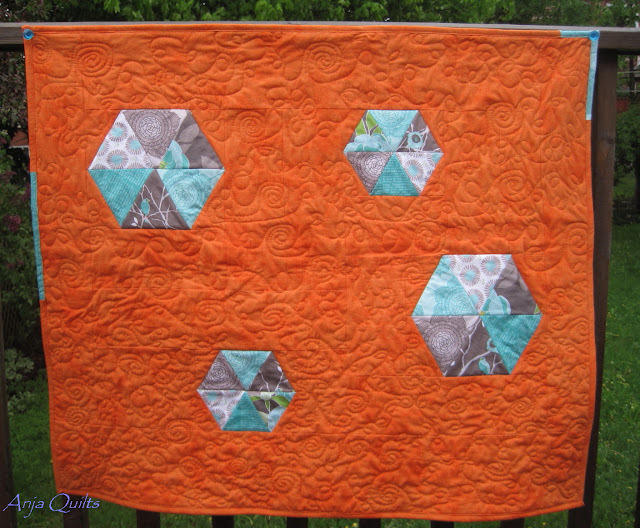 The 2015 New Quilt Bloggers is being hosted by Stephanie @Late Night Quilter, Cheryl @Meadow Mist Designs, Yvonne @Quilting Jetgirl, and Terri Ann @Childlike Fascination. I decided to participate so I could meet some new friends and learn new things. Some months ago, the Modern Quilt Guild (aka the Mother Ship as it's lovingly referred to by the Maritime Modern Quilt Guild) put out a challenge using fabric from The Cottage Garden collection by Riley Blake Designs. Anyone participating received six fat eighths from The Cottage Garden collection. Free fabric -- who could resist that. I had a bit of a vision and looked forward to the opportunity to design something. I have been struggling with the fact that I only create from patterns, and I want to learn to design. But...then life got in the way. MMQG decided to host a viewer's choice award amongst our members, and the deadline to submit was yesterday (but we were given a grace period of today). Thankfully, I work well under pressure, so last night, I was sewing like a mad woman. The blocks on the back are from my original vision -- couldn't let good fabric/blocks go to waste. I'm still working on my FMQ skills. The thread kept breaking on the Wee Wiggler, so finally at 10:00 p.m., I had to finish on my trusty Singer. 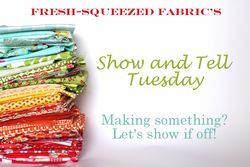 I encourage you to hop over to Show and Tell Tuesday to see what others are showing off today. Visit with Katy Quilts as well. 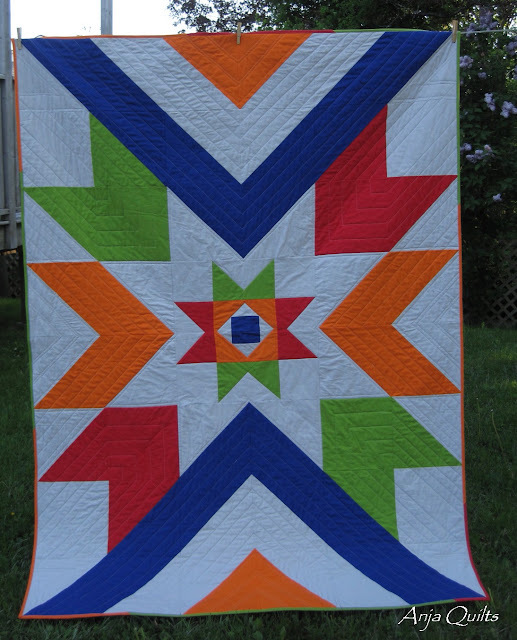 She has some awesome projects, including Quilts of Valor.